Morton is promoting the effort with 100 parties in 100 cities in as many days, hosted by bloggers in their homes. After debuting on Morton Salt packages in 1914, the now iconic Morton Salt Girl with her yellow dress and umbrella is turning 100 years old. "A yearlong campaign will engage consumers, employees, media, and other influencers, as well as refresh the Morton Salt brand," explains Denise Lauer, communications director at the 165-year-old company. As part of the campaign, Morton updated its logo and font to showcase a new look and feel for the brand. The company is promoting the effort with 100 parties in 100 cities in as many days, hosted by bloggers in their homes. The brand expects bloggers to post photos and reviews of parties on social channels. Photos tagged with #mortonsaltgirl100 will also feed into the Morton Salt Girl site. 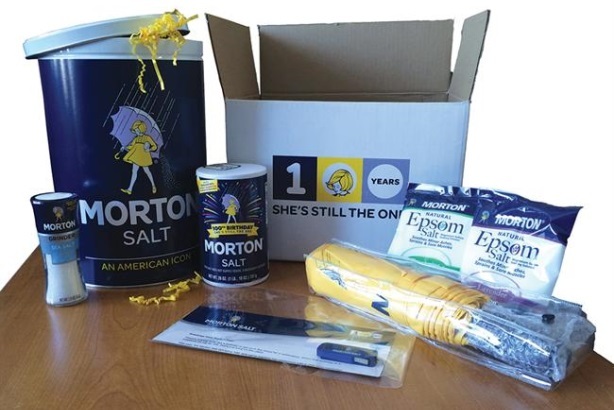 Each host receives a party kit in the shape of a branded oversized table-salt container full of games, decorations, recipes, and Morton Salt products. The company kicked off a Facebook promotion in February that will run through May, where select consumers receive gifts, including soda makers and skin cleansing systems. The promotion will highlight Morton’s full product range, as consumers often only think of table salt. In January, Morton launched MortonSaltGirl100.com with brand-related content posted by consumers and the company. Morton will also partner with Chicago’s Wrigley Field, which also turns 100 this year, for Morton Salt Girl Day in May. There will be giveaways and a Morton representative will throw out the first pitch of the game. On Halloween, a Morton Salt Girl look-alike contest is being planned for consumers. To connect with media in the coming months and tell Morton’s stories, Ketchum has an editorial strategy to hit food, business, consumer lifestyle, and marketing sectors, says Tina-Marie Adams, client director for Morton at the firm.